BAKUTEL - Favourable way to any market of the world! - I work for a company that produces network management systems. Hence, I have a professional interest and desire to meet potential clients and partners. 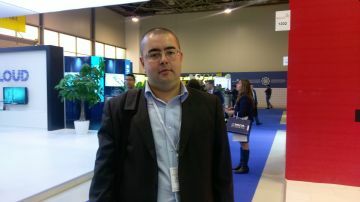 We work in a number of the CIS countries, and Azerbaijan is also interesting to us. I have found certain contacts and exchanged some information and necessary data. Now our company will work toward establishing links in the local market. The exhibition has been organized quite professionally. I liked the stand of Azercell with reproducible virtual reality. I think that entertainment should also take place at such events. In the future, I would like to see representatives of mass media (TV and radio) companies of Azerbaijan among the participants. In my opinion, the exhibition provides a profitable way to the market of a country; the globalization process would be more complicated without it.